Just 10km from France in the Wallonian region of Belgium lies Brasserie Dupont. They started as a farm in 1759, and became a farm brewery in 1844. Oliver Dedeycker is 4th generation owner of Dupont, and has been committed to maintaining the time tested methods of producing this beer. From the old gas burner under the boil kettle, the open square fermentation tanks, and laying the bottles on their side for secondary fermentation (much like traditional method sparkling wine), Brasserie Dupont continues to make some of the worlds utmost benchmark farmhouse ales. 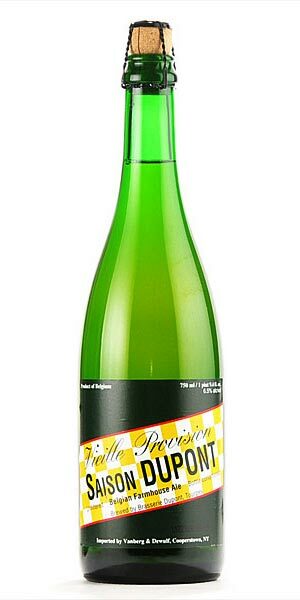 This is Brasserie Dupont’s flagship beer – this beer has been virtually unchanged for generations. Always made the same way, with the same ingredients, and the same house yeast that Oliver’s grandfather cultivated in the 1940’s. The beer is fermented in old square tanks, and then again in the bottle until the brewery decides it’s ready. With yeasty aromas of citrus, freshly cracked pepper, and cracker that leads into a lively carbonated palate with firm bitterness.